During the session, the example transforms and plots data, runs statistical tests, and estimates a multiplicative seasonal ARIMA model. The data set, which is stored in mlr/examples/econ/Data_Airline.mat, contains monthly counts of airline passengers. The folder mlr is the value of matlabroot. At the command line, load the Data_Airline.mat data set. 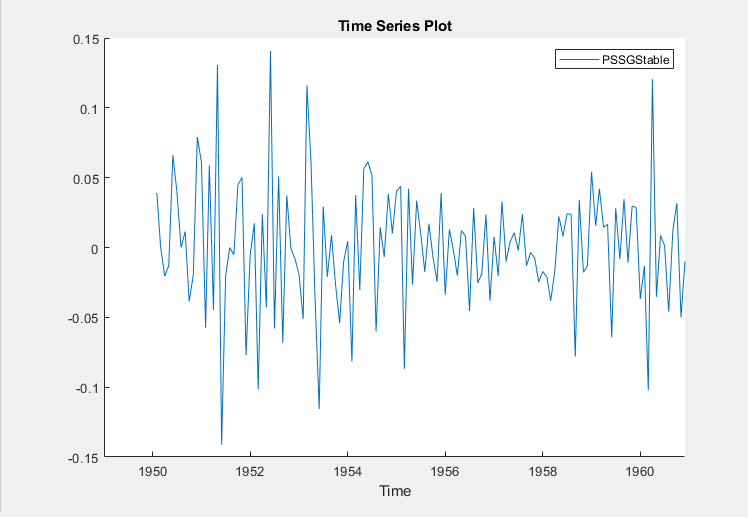 The variable PSSG appears in the Data Browser, and its time series plot appears in the Time Series Plot(PSSG) figure window. The series exhibits a seasonal trend, serial correlation, and possible exponential growth. For an interactive analysis of serial correlation, see Detect Serial Correlation Using Econometric Modeler App. 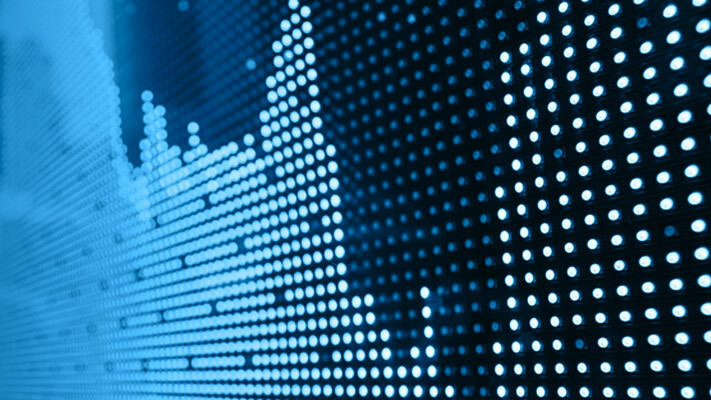 Address the exponential trend by applying the log transform to PSSG. In the Data Browser, select PSSG. On the Econometric Modeler tab, in the Transforms section, click Log. 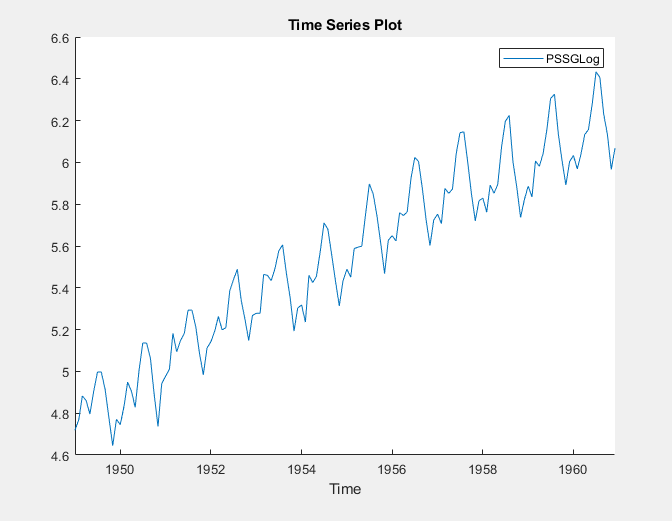 The transformed variable PSSGLog appears in the Data Browser, and its time series plot appears in the Time Series Plot(PSSGLog) figure window. The exponential growth appears to be removed from the series. Address the seasonal trend by applying the 12th order seasonal difference. 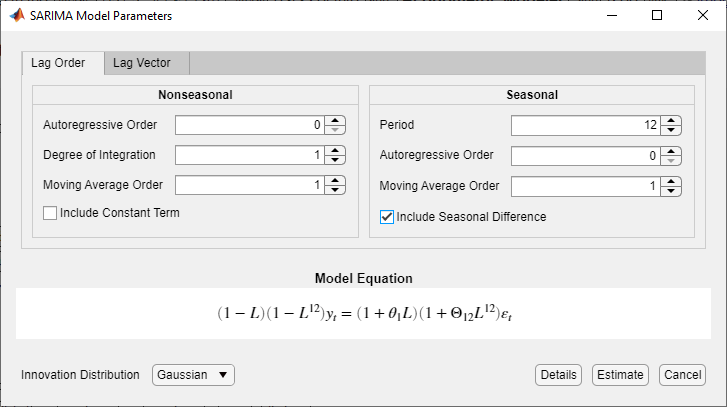 With PSSGLog selected in the Data Browser, on the Econometric Modeler tab, in the Transforms section, set Seasonal to 12. Then, click Seasonal. 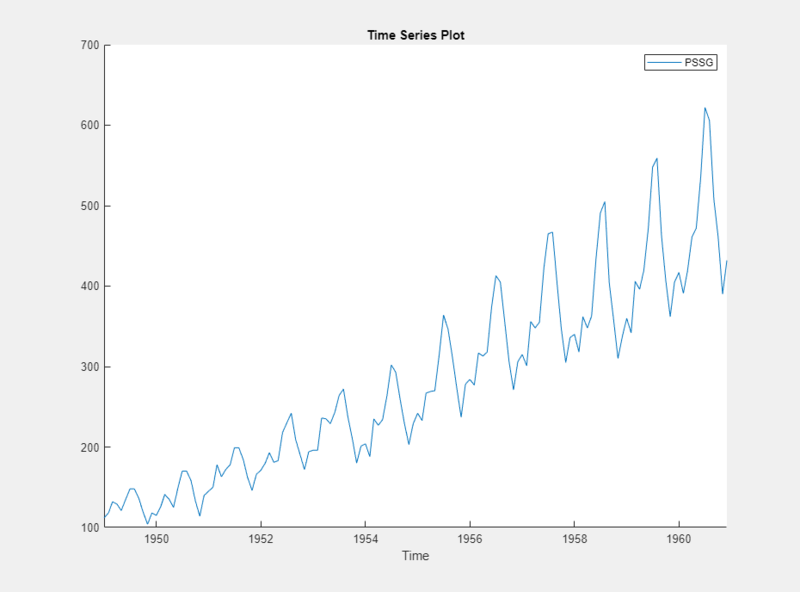 The transformed variable PSSGLogSeasonalDiff appears in the Data Browser, and its time series plot appears in the Time Series Plot(PSSGLogSeasonalDiff) figure window. The transformed series appears to have a unit root. Test the null hypothesis that PSSGLogSeasonalDiff has a unit root by using the Augmented Dickey-Fuller test. Specify that the alternative is an AR(0) model, then test again specifying an AR(1) model. Adjust the significance level to 0.025 to maintain a total significance level of 0.05. With PSSGLogSeasonalDiff selected in the Data Browser, on the Econometric Modeler tab, in the Tests section, click New Test > Augmented Dickey-Fuller Test. On the ADF tab, in the Parameters section, set Significance Level to 0.025. In the Parameters section, set Number of Lags to 1. The test results appear in the Results table of the ADF(PSSGLogSeasonalDiff) document. Both tests fail to reject the null hypothesis that the series is a unit root process. Address the unit root by applying the first difference to PSSGLogSeasonalDiff. With PSSGLogSeasonalDiff selected in the Data Browser, click the Econometric Modeler tab. Then, in the Transforms section, click Difference. The transformed variable PSSGLogSeasonalDiffDiff appears in the Data Browser, and its time series plot appears in the Time Series Plot(PSSGLogSeasonalDiffDiff) figure window. In the Data Browser, right-click PSSGLogSeasonalDiffDiff. In the context menu, select Rename. The app updates the names of all documents associated with the transformed series. 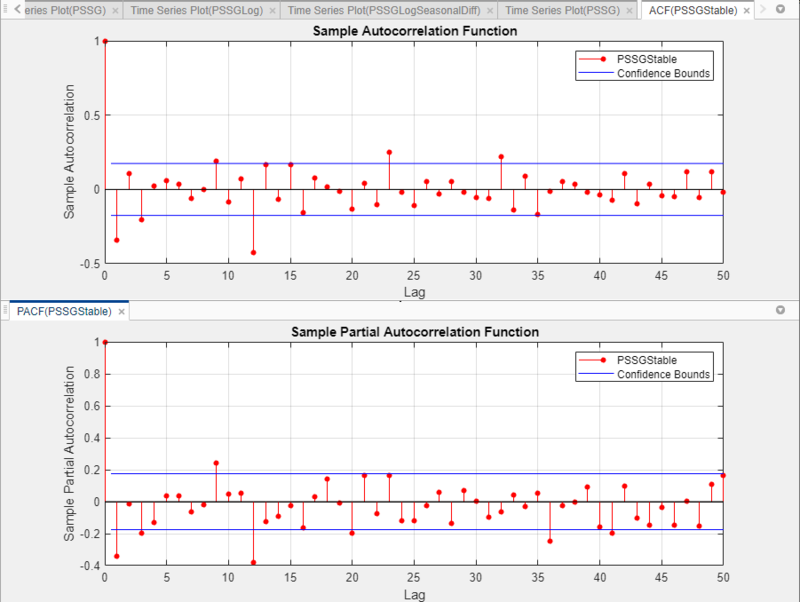 Determine the lag structure for a conditional mean model of the data by plotting the sample autocorrelation function (ACF) and partial autocorrelation function (PACF). With PSSGStable selected in the Data Browser, click the Plots tab, then click ACF. Show the first 50 lags of the ACF. On the ACF tab, set Number of Lags to 50. Click the Plots tab, then click PACF. Show the first 50 lags of the PACF. On the PACF tab, set Number of Lags to 50. Drag the ACF(PSSGStable) figure window above the PACF(PSSGStable) figure window. According to , the autocorrelations in the ACF and PACF suggest that the following SARIMA(0,1,1)×(0,1,1)12 model is appropriate for PSSGLog. 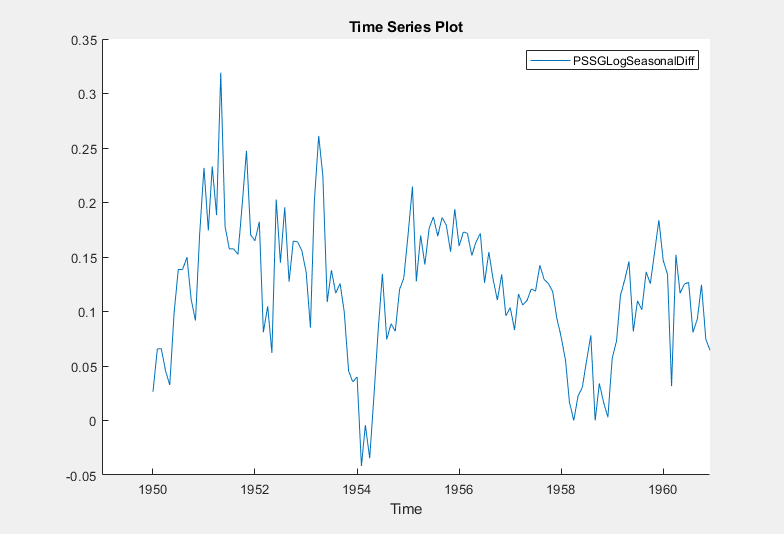 In the Data Browser, select the PSSGLog time series. Set Degrees of Integration to 1. Set Moving Average Order to 1. Clear the Include Constant Term check box. Set Period to 12 to indicate monthly data. Select the Include Seasonal Difference check box. 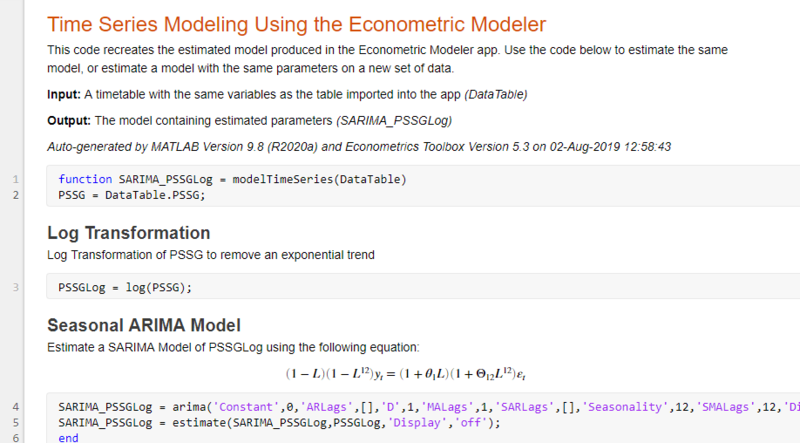 The model variable SARIMA_PSSGLog appears in the Data Browser, and its estimation summary appears in the Model Summary(SARIMA_PSSGLog) document. Export PSSGLog, PSSGStable, and SARIMA_PSSGLog to the MATLAB Workspace. On the Econometric Modeler tab, in the Export section, click . In the Export Variables dialog box, select the Select check boxes for the PSSGLog and PSSGStable time series, and the SARIMA_PSSGLog model (if necessary). The app automatically selects the check boxes for all variables that are highlighted in the Data Browser. At the command line, list all variables in the workspace. The contents of Data_Airline.mat, the numeric vectors PSSGLog and PSSGStable, and the estimated arima model object SARIMA_PSSGLog are variables in the workspace. Forecast the next three years (36 months) of log airline passenger counts using SARIMA_PSSGLog. Specify the PSSGLog as presample data. 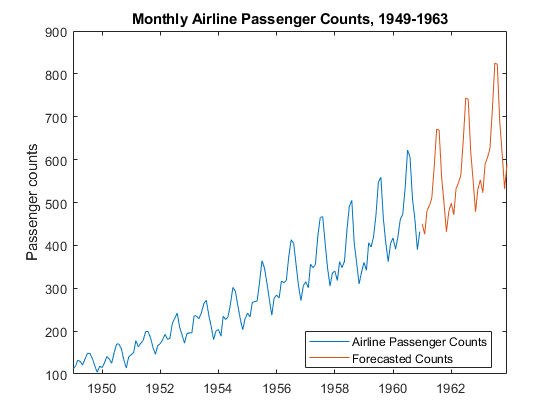 Plot the passenger counts and the forecasts. Generate a MATLAB function for use outside the app. The function returns the estimated model SARIMA_PSSGLog given DataTable. In the Data Browser of the app, select the SARIMA_PSSGLog model. On the Econometric Modeler tab, in the Export section, click Export > Generate Function. The MATLAB Editor opens and contains a function named modelTimeSeries. The function accepts DataTable (the variable you imported in this session), transforms data, and returns the estimated SARIMA(0,1,1)×(0,1,1)12 model SARIMA_PSSGLog. On the Editor tab, click Save > Save. Save the function to your current folder by clicking Save in the Select File for Save As dialog box. At the command line, estimate the SARIMA(0,1,1)×(0,1,1)12 model by passing DataTable to modelTimeSeries.m. Name the model SARIMA_PSSGLog2. 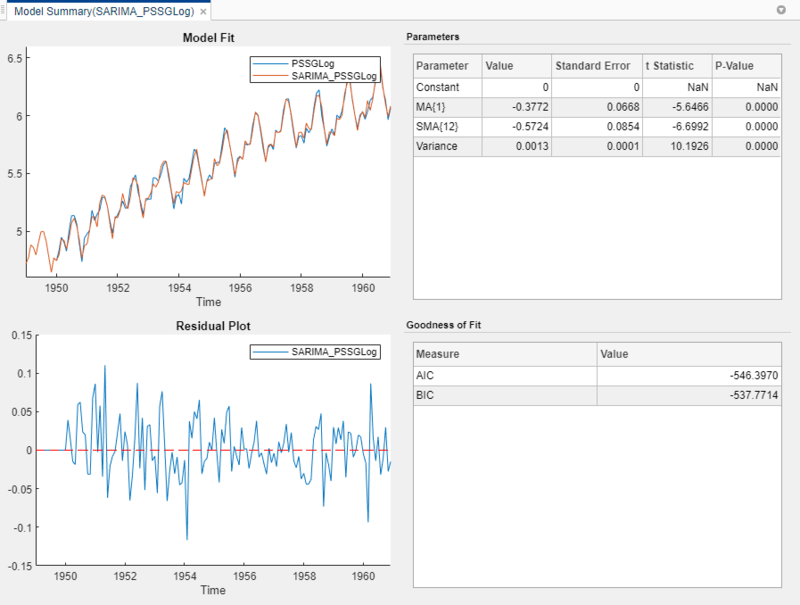 Compare the estimated model to SARIMA_PSSGLog. As expected, the models are identical. Unlike a plain text function, a live function contains formatted text and equations that you can modify by using the Live Editor. Generate a live function for use outside the app. The function returns the estimated model SARIMA_PSSGLog given DataTable. On the Econometric Modeler tab, in the Export section, click Export > Generate Live Function. The Live Editor opens and contains a function named modelTimeSeries. The function accepts DataTable (the variable you imported in this session), transforms data, and returns the estimated SARIMA(0,1,1)×(0,1,1)12 model SARIMA_PSSGLog. On the Live Editor tab, in the File section, click Save > Save. 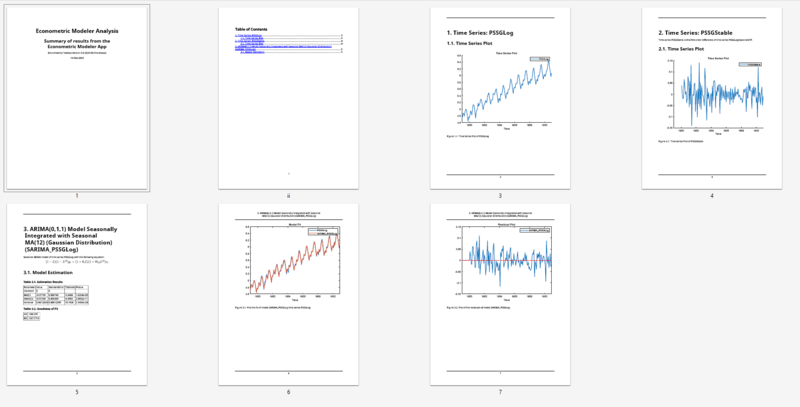 Generate a PDF report of all your actions on the PSSGLog and PSSGStable time series, and the SARIMA_PSSGLog model. On the Econometric Modeler tab, in the Export section, click Export > Generate Report. In the Select Variables for Report dialog box, select the Select check boxes for the PSSGLog and PSSGStable time series, and the SARIMA_PSSGLog model (if necessary). The app automatically selects the check boxes for all variables that are highlighted in the Data Browser. In the Select File to Write dialog box, navigate to the C:\MyData folder. In the File name box, type SARIMAReport.